Occasionally, both a human and its canine companion are in need of a helping hand. When friends rally round to the rescue, a gift of gratitude is proper etiquette. Yes, that's a dog pawsitive tidbit! Many of my readers and friends already know that my dog and I are in need of a helping hand at the moment. For those of you just now hearing this news, you can read full details of our needs in the FundRazr to help us move across the country to a safe and secure place. Friends, dog lovers, and strangers have come to our aid in many ways, providing moral support as well as temporary housing and financial help. It has done my heart good to know that I worry not alone, that goodness prevails in the kindness shown. As of this writing, we have almost reached half (48%) of our fundraising goal. (Made possible by your generosity!) I am confident that through faith and friends we will meet our needs. I find myself overwhelmed with feelings of gratitude for being on the receiving end of the giving spirit of others. 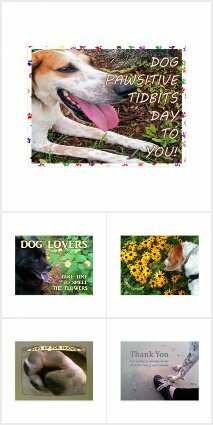 Today, I created a few gifts of gratitude in my Dog Pawsitive Tidbits Zazzle store to go along with the FundRazr, a way of saying, "Thank you" to those who have made, or will make, donations for our cause. I am asking each person who contributes to our FundRazr cause to please email me (webmistress at abitosunshine dot net) with a mailing address to where I can ship your gift. Yes, this is retroactive to those of you who have already given! Gratitude gifts will be mailed or shipped once my dog Valentino and I have reached our destination in the state of Washington and settled in a bit. I appreciate your support as well as your patience. Please accept my gift as appreciation for your giving spirit ... a small token of my gratitude. As you can see, these gifts to you from my heart truly come from me and my dog — the foot in the image design is mine and the paws are my dog Valentino's! Visit our FundRazr to learn more, to contribute, and/or to share — We thank you!